For years, users have had the ability to connect into Dynamics GP directly from Excel. However, the only easy connection and therefore the only kind done by non-SQL techs was a direct connection to one GP data table, which very much limited the usefulness of this feature. But, these days, the GP developers have created many more “user friendly” data views which link the information from several tables together, making it much easier to create reports without being a coding expert. 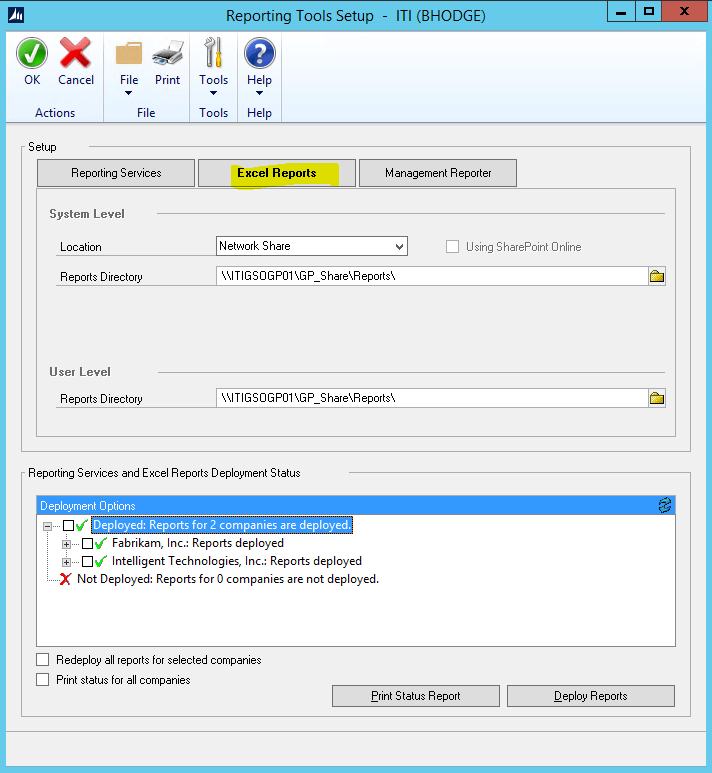 You can find them by going to “Reporting Tools Setup” in GP Dynamics System Setup. Depending on which version of GP you’re using, your window may look slightly different than mine shown below, but the result is the same. You can deploy the Excel reports from within Dynamics GP to a network path and these reports will have a “hot link” to your GP data. This means that each time you open or refresh a report, it looks at the data and retrieves the information via an “ODC”, or “Office Data Connection.” In other words, the Excel Report looks directly into the linked GP tables and retrieves results. You must have the necessary security to run them, meaning you have permissions for the location on the network, as well as SQL permissions for the data. You will need to enable the external content from within Excel. While these reports are nice and many are very useful as-written, frequently clients need the information tweaked for their own specific needs. Adding information to these Excel reports in Dynamics GP is usually a fairly quick task, as long as the desired additional data is already linked or easy to link in. It’s a matter of modifying the ODC and possibly adding a new SQL view to your SQL installation. The Dynamics GP reporting experts at Intelligent Technologies, Inc. can help! Whether you need Excel report modifications, assistance with report deployment or setting permissions, we’ve got you covered! Contact us to get started using Excel reports in Dynamics GP. The holidays are stressful, closing your accounting books for the year shouldn’t be. Enjoy smooth sailing through the Dynamics GP year-end close process with our new e-guide. It brings together everything you need to know and wraps it up neatly in one convenient package. Download your copy now.